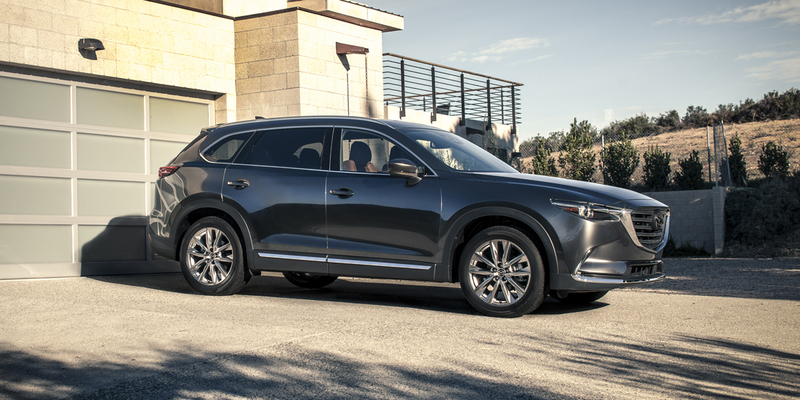 CG Says: After last year’s redesign, the 2017 Mazda CX-9 is little changed. Smart City Brake Support is now standard on Touring models. The CX-9 is 1.2 inches shorter than its predecessor but rides a wheelbase that’s 2.2 inches longer, which aids both legroom and rear-seat entry and exit. As before, Mazda’s midsized crossover SUV has three rows of seating for up to seven passengers. A 250-horsepower turbocharged 2.5-liter 4-cylinder paired with a six-speed automatic transmission is the sole powertrain. It replaces a 273-horsepower 3.7-liter V6. With its smaller engine and an estimated 200-pound weight reduction, CX-9’s fuel economy is among the best in the midsize-SUV class. CX-9 is available with front-wheel drive or all-wheel drive. The CX-9 offers Mazda’s i-ACTIVSENSE suite of safety features, which includes blind-spot monitoring, adaptive cruise control, lane-keep assist with lane-departure warning, auto-dimming high-beam headlamps, forward collision warning, and automatic braking systems. The CX-9 has a quiet, upscale cabin, along with engaging road manners for a midsize SUV. Although more spacious than the previous-generation, CX-9 is not quite as roomy as some competitors.